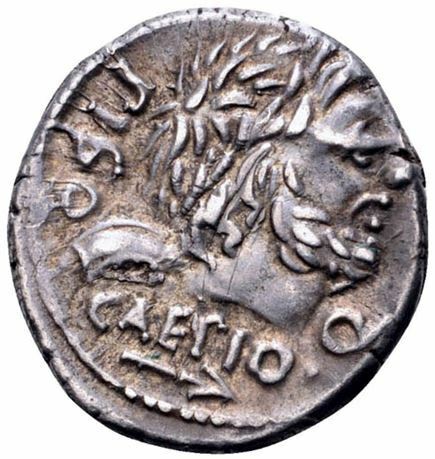 Quintus Servilius Caepio the Younger struck coins in the year 100 BC, as part of this tenure as Quaestor Urabanus in the same year. In 92 BC, Caepio prosecuted Marcus Aemilius Scaurus, the eminent princeps senatus, for supposed provincial extortion and, it seems, for taking bribes from Mithridates VI of Pontus. Scaurus managed to issue a counter-accusation against Caepio, and the two accusations collapsed. During the Social War, Caepio was made a Legate in the Roman Army. He was captured and executed by the Italian allies after being tricked into leaving a secure position. Gens Servilia was a patrician family at Rome. The gens was celebrated during the early ages of the Republic, and the names of few gentes appear more frequently at this period in the consular Fasti. It continued to produce men of influence in the state down to the latest times of the Republic, and even in the imperial period.